It was thickly dark, the cold air rising in the high concrete tunnel, making a dull rushing sound- perhaps it was wind, perhaps it was the sheer loneliness of the place. The blackness was really absolute; you would not know of the platforms or the blandly tiled walls or the trench lined with a metal track at all if you had been there, for the electric lights that had once lit the place had long sputtered out. But there was a sound, under the dull rushing of air: claws softly scratching concrete. It echoed and faded and the rushing hum continued. The claws scratched, and the sound of pebbles or fragments being disturbed penetrated the darkness. There came a sharp bark, from above. “Mhumhi, come up right away! Hurry!” From far above, where the tunnel sloped, there was a patch of light, arc-shaped, and shadows crossed it. There was a scrabbling and a scraping, and then a tall, lean dog pushed his way through the arc of light, squeezing from between a piece of metal siding and a concrete wall, blinking hard in the fierce daylight. He was not a domestic dog. His coarse coat was patterned brown and black and pale like dappled sunlight. His ears were cupped and round, the expression on his dark face inscrutable, as his white-flagged tail curled low between his legs. 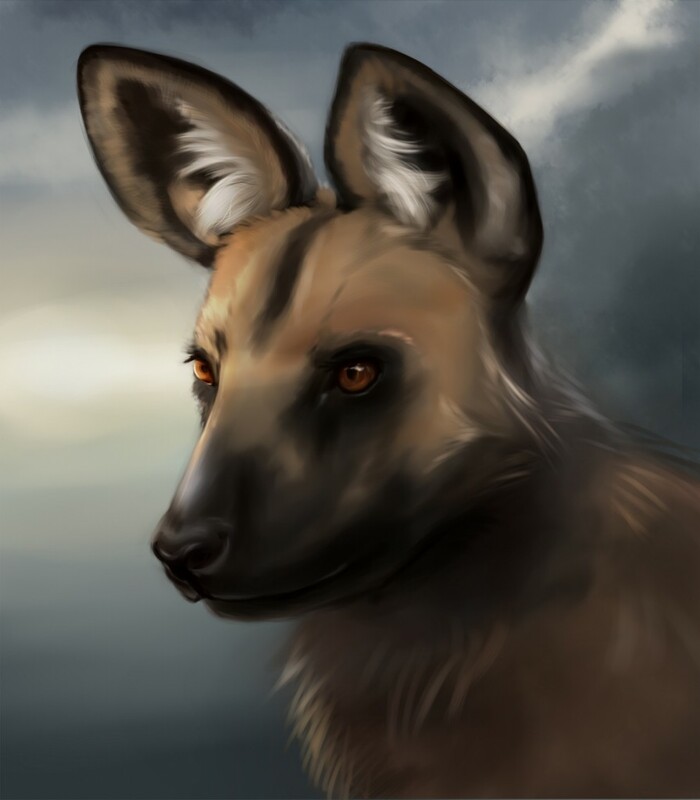 He was what was called a painted dog- a kind of wild dog. The painted dog turned and looked back at the metal siding, sniffing the air. A little rain was falling, making dark spots on the concrete sidewalk and washing the dust off of the street beyond. The wall he had emerged from was squat and unappealing, all red faux-brick with a flat iron roof, which the rain was beginning to patter against. There was a door in the wall, a few feet away, but it was heavy, and shut. A second dog emerged from the hole behind the siding. This one was much smaller, coming barely to Mhumhi’s knee, and was solid brown with dark legs. Everything about her was short and squat, even her ears, which were tiny and round, and her eyes were narrow in her small bear’s face. This dog was called a bush dog, and though she was very small, her expression made it clear that she was just as much a wild dog as her larger companion. “Don’t go down there again, Mhumhi,” she said. When she spoke she did not move her lips, but rather opened and closed her mouth, the same high sounds that Mhumhi had used emerging somewhere from the back of her throat. “I think there are dogs that live down there…” she continued, but trailed off, raising a lip slightly in annoyance. Mhumhi was twittering and chirping at her and trying to lick her chin. Mhumhi said nothing to this, but he stopped licking, and trotted a few steps away, looking back at the siding. Sacha eyed him. “She’s not injured, Mhumhi,” said Sacha, raising her lip a little again, and Mhumhi’s tail, which had been wagging, went limp. Mhumhi stiffened. Sacha looked away for a moment. Mhumhi cast one last look back at the siding, blinking from the rain, and then shook himself and followed her as she moved onto the street. It was midday, and they were in a mostly unpopulated part of Oldtown, so around them the city was quiet. It was more of the squat little buildings, most of them bleached white plaster with the same flat roofs, crammed tight together along the wet, pale street. Here and there the harsh odor of dung or urine marked a dwelling, but both Mhumhi and Sacha failed to give it more than a cursory sniff or two. They stopped to get out of the rain for a moment under an overhanging metal eave, panting, breath steaming. Sacha shook herself, and then again, snorting at the wetness. Mhumhi sat down and half-heartedly scratched at his shoulder with his rear claws. The building across from them had a half-open door, and Mhumhi saw something peep out at it to look at them: a small face, as small as Sacha’s, with grey-and-black markings. It vanished as quickly as it had come. “Gray fox,” said Sacha. Her tone was dismissive. The gray fox reappeared in the doorway, and beside it, another one poked its head out. This one yapped across the street at them. Mhumhi raised his head, tail wagging slightly, but Sacha shot him a look. This seemed to bewilder the foxes, and they put their heads together and conferred for a moment before the male spoke again. “We have not!” said Sacha. “Go away!” She uttered a fierce whine. This seemed to startle the foxes so much that they vanished entirely, and the door snapped shut. Mhumhi thought this statement over. He decided not to point out that their hunger might not be what caused the dispensaries to run or not; Sacha did not like being corrected. Together they trotted through the crammed-in dwellings of Oldtown, gradually reaching more populated areas, where other dogs wandered listlessly around in the wet. Most of them were foxes, or the size of foxes. They watched lanky Mhumhi pass with a certain wary focus, but the vast majority of them knew of him already, and if they didn’t they’d notice how meekly he followed the diminutive Sacha. He was not like other painted dogs. They came to a sort of groove in the street with a metal rail running through it- a track for a trolley. Sacha sniffed at it warily and then hopped over it. Mhumhi made a show of stepping over it, posturing with his longer legs. She snorted at him and then turned to continue walking, tail up and rigid. They had arrived on their home street, and Mhumhi let his tongue hang out when he saw their house. It was one of those same packed-in buildings, looking identical to every other, but the mingled scent of his small family made him feel warm in the chilly rain. Sacha ran up to the front wall and backed up against it, nearly doing a handstand on her front paws, to mark it with urine. “Police won’t like that,” said Mhumhi, waving his tail. “If the police ever come here, they can tell me how much they don’t like it,” replied Sacha, and she ran to the door and nosed it open. Mhumhi darted after her, joining in her whining and yowling when he crossed the threshold with his own chirps and chatter. 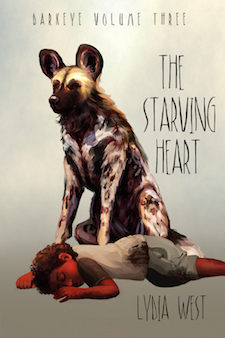 They heard yapping from the second floor, and clattering down the narrow stairs came a medium-sized, reddish dog, smaller than Mhumhi but still dwarfing little Sacha. Her black brush of a tail was wagging furiously and she ran to try and lick under Sacha’s chin. Mhumhi bounded in place once or twice and then joined her, bathing poor Sacha, who twisted and growled at them. The red dog, which was called a dhole, parted her teeth in a smile, her tongue hanging out. Mhumhi panted happily in response and gave her a few licks around her jowls. She put a paw on his shoulder, pushing him away, and sniffed around his forehead and ears. “Did you go to the subway again?” she asked. “Well, that’s good- that’s a start-” Kutta said, eyes bright, but Sacha interrupted her. “He’s not going back. And neither are you.” She caught Kutta’s gaze in a hard stare until she lowered her head and wagged her tail between her legs. “All right,” Kutta said, looking away. Mhumhi’s tail lowered too, though it was more related to the thing about the meat. Sacha left them to go lap up some water from the small basin in the corner. Kutta nudged Mhumhi with her shoulder and lead him up the stairs. Kutta swung her head around to stare at him, but before she could reply a puppy burst out at the top of the stairs and began yapping shrilly. “Oh go away, Kebero, let us through,” Kutta said, shoving at his chest with her nose, and he backed off, ears back and rump wagging against the ground. Like Kutta he was reddish, but paler, with a white underbelly and a narrow, foxy face: he was a Simien wolf. He was half-grown, not quite all the way weaned; but Sacha and Kutta could not produce milk for him, so meat was what he got. Now he danced around Mhumhi’s front paws, all a-wag, licking furiously at his chin, and Mhumhi swallowed hard and leaned away. “I ate so long ago, I think it’s all gone,” he said. Kutta walked over and poked him hard with her nose in the corner of his mouth, and with a surprised gag he opened his mouth and regurgitated a small pile of meat onto the floor. Kebero was on it at once, with enthusiasm that made up for his lack of skill at chewing. Mhumhi wanted to whine. Until Kebero had gotten there he HAD been the puppy of the family, and hadn’t had to give up any of his meat at all. They left Kebero to his clumsy eating and leapt up together onto the moldy-smelling bed. Kutta started licking the subway dust and rain out of his fur. “Did Sacha really say Mother left us?” she said, eventually. Mhumhi, chin resting on the well-worn coverlet, rotated his ears forward and back, thinking of how Sacha had put it earlier. Mother may not be dead. She stopped herself, raising her head to look at Kebero, who was sitting on the floor next to the remains of Mhumhi’s meat. He was watching them, head tilted. At Kutta’s look he licked his lips and gave his ropy tail a tiny wag. Mhumhi could recall the day his mother had brought them Kebero, a tiny thing, a mere brown smudge of life with round useless legs and closed eyes. “Your brother,” she had said. Mhumhi, three months younger then, had not understood at the time the look that Kutta and Sacha exchanged, or why Sacha got up and left whenever their mother entered a room for several days afterward. “Come up, Kebero,” he said now, wagging his tail a little, and Kebero bounded eagerly to his feet and made a clumsy go of jumping up on the bed, sliding halfway back down before he managed to get on top. He situated himself, wagging, in a small space between the longer backs of his siblings. 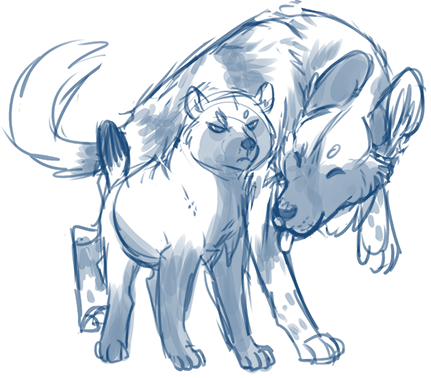 Kutta made a little sound, not entirely pleased, but rolled over to give Kebero a few licks between the ears. The three of them dozed together for a while, Kebero occasionally squirming and kicking, listening to the loud patter of rain on the metal roof above them. The acrid smell of it grew stronger, as did the strong scent in the room coming from Mhumhi’s wet body. He licked his broad paws, trying to tease it out of his fur, but it was a halfhearted effort at best. Sacha came up the stairs, hopping each one, glanced at them, and went left. She disappeared into the other upstairs room. Mhumhi rolled over with a sigh and stretched, eyes closed, feeling the warm little knot that was Kebero behind him. He indulged himself in a fuzzy half-daydream: his mother had been small, too, smaller than him when he reached his full size, though at one point in his life she was the biggest thing he had ever seen… He could imagine that she was still there, behind him, smelling of milk and warmth and home. Abruptly he jerked up, out of his half-doze, for from outside there had come a loud howl, a sort of bay of rage, then a volley of fierce barking. He nearly bowled over Sacha on his way to the door, and heard her give a startled utterance of some sort, but he paid it no mind and shoved his way through the door and outside onto the wet street. Outside it was chaos, pure chaos- there was yelping and snarling and blood running through the cracks in the asphalt, a mass of dogs, most of them small, two of them big, and struggling with one another. Mhumhi tripped over a small fox that was lying very still, and suppressed a frightened shudder, pushing his way through. He was hoping to see a dog with a dirty white coat and a curled tail, smelling of milk and warmth, but when he saw the fighters he fell still. One was a golden jackal, yapping and snarling, the other was a massive domestic dog, solid and broad, all dense rusty fur. His muzzle was streaming with blood, and when he turned his head to look at Mhumhi all Mhumhi could see was the meat clenched between his teeth and his brilliant blue eyes filled with fear. Do you welcome/want proofreading comments? Just found this via Newt in the Throat, which I found while searching for images of butterfly bats. Really enjoying your pictures and natural history blurbs! I’m certainly not adverse to proofreading! At the moment I don’t have time to edit individual chapters of Darkeye, but I will save all the comments for my eventual mass edit of the entire work when it’s complete. “there was a bunch of rocks” This might just be that Mhumhi uses poor grammar, but should be “were a bunch of rocks”, or “was a bunch of rock”. “The dispensaries don’t stop working. We’d starve.” won’t stop?